Download Heroes of Hellas 3 for free at FreeRide Games! Rebuild Athens from the ashes of its destruction and secure the help of the Heroes of Olympus as you battle an evil god! When calamity strikes the capital city of Hellas, the people turn to you for help. Through addictive Match 3 gameplay and compelling city building interludes, you will gather gold, meet the needs of a ravaged population, and search for legendary lockets that will allow you to summon the gods and appeal to them for help. Heroes of Hellas 3: Athens will challenge you to click-and-drag your mouse cursor across chains of identical items to remove obstacles, activate bonus items and collect valuable objects. As you call upon the gods to unleash their powers, dazzling visual effects will ignite the game screen and help you to achieve your goals quickly. Between levels, you'll be able to interact with the people of Athens and restore the city to its former glory. Two years in the making, Heroes of Hellas 3 is both a spectacular epic and a highly accessible Puzzle/Match 3 game. 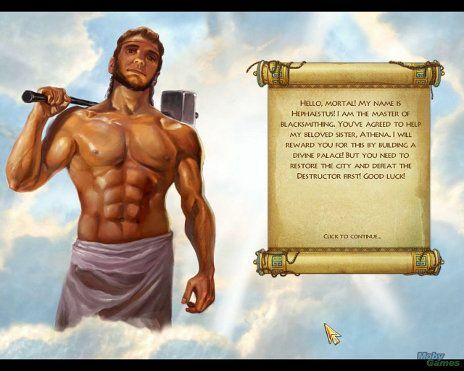 Are you ready to meet the gods? Rebuild the capital of Hellas. Unleash the might of the gods with dazzling power-ups. Play spectacular mini-games including Hidden Object and Jigsaw Puzzles.